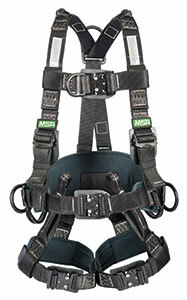 The Gravity Utility Full Body Harness from MSA Safety is designed to self-extinguish quickly to prevent melting or dripping in the event of an arc flash. This harness keeps workers safe around electrical hazards at heights. The harness includes two shoulder straps and two horizontal straps across the chest and abdomen, as well as individual straps for both legs.